In the sheet metal transformation field, the new automatic panelling machine developed by DANOBAT, its BM model, will be on display. This panelling machine guarantees high productivity and minimises machine changeover times. The single tool bending concept, on the one hand, and its automatic manipulation, on the other hand, turn the BM panelling machines into the ideal solution for large production volumes, both for short series and for large series. In short, the DANOBAT BM panelling machines provide the optimal solution for all types of bending processes, from simple or special ones, to the most difficult ones, as well as for high added value applications. DANOBAT continues to commit to the development of special and innovative solutions with the aim of satisfying each one of its customers’ specific needs. In this case, the new LASER BLANKING will be presented at the fair. 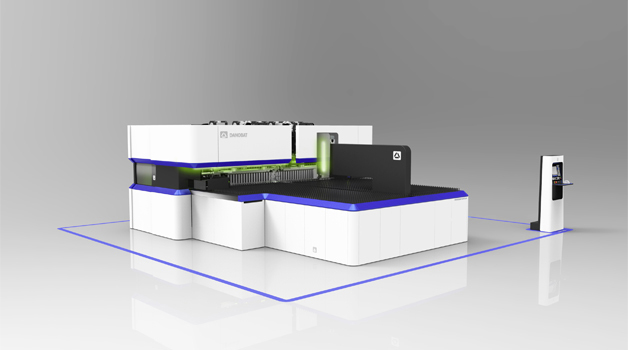 This is a flexible fibre laser cutting system, in which the material to be processed comes from a coil instead of in sheet formats. It is a high productivity machine that combines each one of the advantages provided by fibre technology applied to laser cutting, with the advantages derived from the use of metal coils. Likewise, DANOBAT continues to develop specific and customised solutions for specific sheet metal transformation applications, such as the manufacture of metal doors, silos, hotel and catering, metal furniture, etc. These solutions are the result of the work that DANOBAT has carried out, together with its customers, for many years. The DANOBATGROUP stand at BIEMH 2016 will also have a specific area for the LATZ cutting tools, which feature high precision, reliability and avant-garde technology. Standard cutting tools and special tools in high-speed steel and hard metal will be on display, among others.